This pattern is available from lucindaguy.com for £4.00. 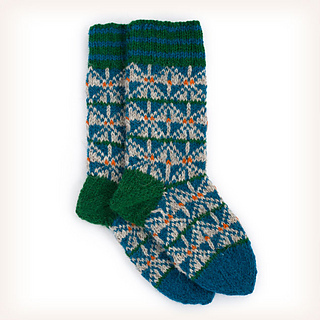 socks that were usually patterned and double thick), these cheerful, warm and woolly Sirri socks are designed for both men and women. 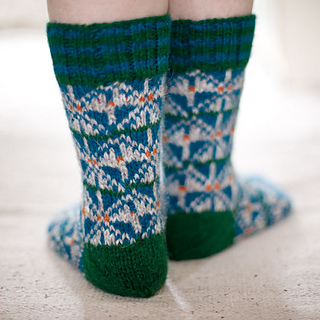 Beautifully thick and cosy these socks will make ideal and much appreciated gifts for any festive occasion. following the same pattern but using a half size larger needle – the tension will be very slightly looser and the sock just that little bit roomier. Achieve the perfect fit by working the heel and trying the sock on for size before you complete the foot and toe. Of course the Sirri Socks can easily be made as leg warmers by simply omitting to mark and knit the heel and finishing with a short matching rib. The Sirri Socks are knitted in an Aran weight (4 Medium) pure wool yarn that knits up to a tension of 20 sts and 21 rnds = 10 cm (4 in). They can be made in two sizes — Small/Medium (22 cm (8¾ in) foot circumference and 42 cm (16¾ in) total length), and Medium/Large (26 cm (10½ in) foot circumference and 46 cm (18¼ in) total length). They require 3 (165 m (180 yd)/100 g 3½ oz) skeins in 3 different colours as well as a small amount of a fourth colour to complete. 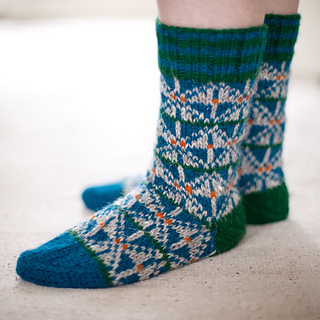 The Sirri socks are knitted in the round with five needles, from the top down with a short, striped ribbed cuff, an easy to work traditional Baltic pattern, peasant (or ‘after thought’) heel and a wedge toe. 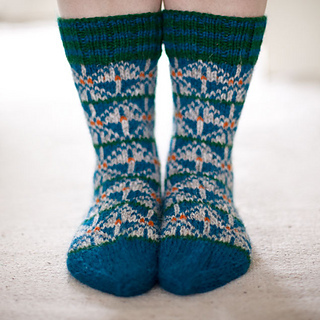 The simple charted pattern is worked using the stranded or Fair Isle technique.